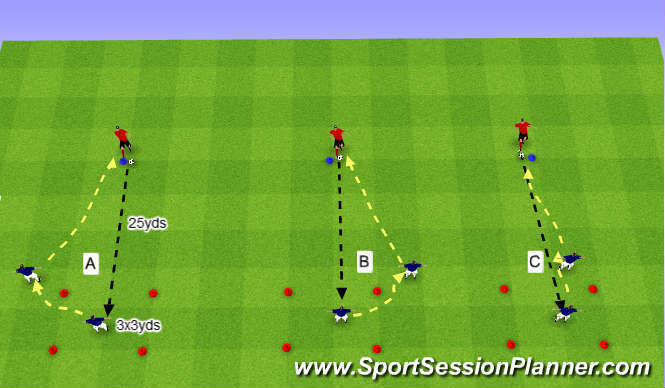 Football/Soccer Session (Moderate): First touch 'out of body' -Bangor City u12s Academy . . . Practice 1 - organisation place plr in box/area (red cones) of 3x3yds and another approx 25yds centrally in front at blue cone whith a ball . 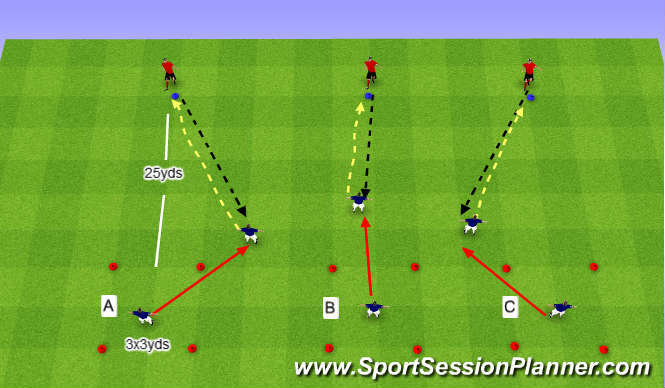 . .
Organisation as previous excersise but now instruct the server to deliver pass &apos;outside of the box&apos; as shown in A&apos;B and C (blackpass) and the plr in the box to move out of box to meet incoming ball control ball and on second touch pass back to server (yellow) again there are three options available to plrs i.e right &apos;left and straight &apos;keep plrs on minimum of two touch . . . Conditioned SSG - organise area of approx 40x50yds with a 6v6 in centre and a plr from both teams at each end to act as &apos;targets&apos; the goal for both team is to get plr at end A into pitch by accepting pass from team mate and entering pitch with fisrt touch &apos;out of body&apos; and entering game on passing out to end plr the passer moves out of pitch to take their place - main ojective/goal is to work ball from line A through pitch by passing and getting the ball to team mate on line B . .